It was definitely a ‘she’ that we saw most of the time. African elephants like their Asian counterparts live in close stable "matrifocal" family groups, made up of related cows (sisters, aunts, cousins), and their offspring. Only younger meeker males are allowed to be part of the family herds; rebellious bulls are asked to leave and fend for themselves. In charge of the group is a big “she”, the matriarch, usually the oldest and most experienced female in the herd. She decides when and where the herd will eat, rest, and travel. We watched fascinated, as herd after herd travelled (each consisting of about 10 elephants) - the big mama with her decades of knowledge and experience leading to the best feeding and watering sites; her daughters and nieces behind her in a single file; their calves in turn following them obediently, sometimes holding on to mommy tails with their strong little trunks - nobody venturing to go out of reach of others. And elephants are unquestionably big, African savannah elephants being the largest land animals on Earth (bigger than even African forest and Asian elephants), adult males weighing between 1,800 and 6,300 kg. At birth, an elephant calf typically weighs between 90-105 kg (200-230 lb) and stands about 1 m (3 ft) tall. Not surprising then that to maintain their enormous bulk, they spend 18 odd hours a day feeding - their inefficient digestive systems do not help either! In an age where we are increasingly occupied to erase out our creases, wrinkles in elephants are welcome as ever - as a cooling mechanism to increase the skin’s surface area. Elephants have difficulty in releasing heat through the skin because, in proportion to their body size, they have very little of it. The additional skin and wrinkles trap moisture, which then takes longer to evaporate. African elephants are even more wrinkled than their forest dwelling Asian cousins, as the former have a greater need to cool themselves. And grey they are, though sometimes it may be quite difficult to spot the grey due to its protective brown or reddish coat that comes from wallowing in mud holes of coloured soil - the mud pack acting as sunscreen, moisture retainer and insect barrier. Surprisingly for a pachyderm or "thick skinned" animal (like rhinos and hippos), even though an elephant's skin can be up to 2.54 cm (one inch) thick on some parts of its body, it is still very sensitive (again like rhinos and hippos). Although massive, elephants can run at speeds of up to 40 kph or 25 mph and trample almost anything in their way. But there are some who benefit from this - cattle egrets feed on the insects that try to get out of the way of the elephants, disturbed by their movement. The association between cattle egrets and elephants is a perfect example of commensalism - a relationship where one party benefits and the other is not harmed. Throughout the elephant procession, cattle egrets were present in great numbers, walking along side or riding them – white specks on a canvas of grey. A big surprise for such a bulky creature - elephants walk on their toes and if required they can walk almost silently! The skeleton of an elephant’s foot is angled, with a large pad of fat and connective tissue at the heel. The angled foot structure means that elephants walk on their tiptoes with their body weight evenly distributed across the fatty padding at the heel, the same cushion that helps to deaden sound and prevent slipping over uneven terrain and swampy ground. An elephant can sink deep into mud, but can pull its legs out readily as its feet become smaller when they are lifted. I remembered the time when Aamir and I were riding an elephant along with other tourists in Jim Corbett National Park, India, while our mahout chased an invisible tiger all over the jungle. The journey sometimes went uphill, downhill and over muddy patches and the ferried passengers held on desperately to their seat handles, but the elephant was super steady and in control all along. Sure enough, we got to hear the famous excited trumpet calls (made by blowing through nostrils) clearly over the cacophony of the wireless radio. But the elephants also communicate by producing and receiving sub-sonic rumbling, a low-frequency sound (infrasound), which can travel in the air and through the ground much farther than higher frequencies (a possible maximum range of around 10 km). Rumbles could mean news about imminent threats, a sudden change of plans or the death of a community member. At water holes, rumbling can be used to indicate a “lets go” call by the matriarch or can alert other elephant family groups not to approach the water until they’re gone, thus avoiding the mass chaos of too many large, noisy bodies at the same watering hole at the same time. Even their stomachs make loud rumbling and growling noises that other elephants can hear, which seem to signal "everything is okay"! And the range of vocalisations work in tandem with a variety of visual signals - from the waving of trunks to subtle angling of the head, body, feet and tail. Elephants certainly use their ears to funnel in sound waves from the environment, contributing to their keen sense of hearing. But that is not the only way they hear. They can feel the rumbling sound made by other elephants with the help of the exquisitely tuned sensors in the padding of their feet and sensitive skin of their trunks, which pick up the resonant vibrations much as the flat skin on the head of a drum. To listen attentively, every member of the herd will lift one foreleg from the ground, and face the source of the sound, or often lay its trunk on the ground. The lifting presumably increases the ground contact and sensitivity of the remaining legs. With such a sophisticated “hearing” mechanism, the elephant certainly hears every sound in the jungle, including a footfall far away. Meanwhile all I could hear were the intense telephonic discussions inside the van on possible achievement of sales targets. 2012 was slowly creeping in here, but across the Atlantic there was still a little more of 2011 left to catch up on! I am certain, after the trip Andrew would have reported to his wife “would you believe it, on my last trip, the mhindi carried a laptop on safari and attended conference calls when surrounded by elephants”! The floppy king-sized ears serve a critical function otherwise - temperature regulation. Elephants do not have sweat glands which would help keep them cool. Their ears are made of a very thin layer of skin stretched over cartilage and a rich network of blood vessels. On hot days, in addition to finding shade and having mud baths, elephants will constantly flap their ears like fans, creating a slight breeze. This breeze cools the surface blood vessels, and then the cooler blood (cooler by as much as 6 °C or 10 °F) gets circulated to the rest of the animal's body. African elephants live near the Equator; and hence they have bigger ears (much like the continent’s map) as compared to Asian ones who live farther north, in slightly cooler climates. A fusion of upper lip and nose, an elephant's trunk has more than 40,000 muscles - that's more than a human has in his or her whole body! It is so strong and agile; on one hand it can push down trees and on the other hand it can pick up a single piece of straw or a single blade of grass! It is a one-in-all appendage - serving as a nose for breathing and highly developed smelling; a hand for grabbing, hand-shaking, play-wrestling and snuggling loved ones; a two way signalling device trumpeting and feeling rumbles; and a tool for gathering food; siphoning, spraying and drinking water; mud dusting; digging; for dominance displays - a raised trunk can be a warning or threat, while a lowered trunk can be a sign of submission; for defence by flailing and flinging; and lots more including as a snorkel when swimming! While drinking, the trunk acts like a hose holding up to 14 litres of water at a time, which is then blown into the mouth. For some of the babies in front of us though, the wobbly trunks seemed not to serve any purpose other than get in the way, as the little ones kept tripping over them. 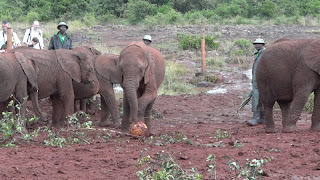 What better place to experience the friendliness of elephants than Sheldrick orphanage adjacent to Nairobi National Park; the trust which has successfully rehabilitated many orphan elephants and reintroduced them into wild. The babies look so incredibly endearing that even circumspect Adi reached out spontaneously to pet the youngest one, sans tusks of course – do not think he would have ventured near anything with tusks. The deep human elephant bonding is evident in the way the baby elephants follow the caregivers in a single file like in a herd, in the way they look forward to being fed by the caregivers – bottles in mouths; the older ones showed that they can hold on to the bottle by themselves - very much like Adi would say "I want to do it by myself". One can sense the camaraderie in the way the babies play football - like Adi would say "time for football" and in the way they tug at the caregiver by the trunk when he is busy talking to tourists and not playing with them - just as Adi would do when he does not get my attention - "talk to me, play with me"! What attracts us so much to the elephants - is it because they are so "human" animals? We have quite a lot in common between us - the same span of life (on an average 70 years) and development from childhood to adulthood at a parallel pace. As is common with more intelligent species, they are born with fewer survival instincts than many other animals. Instead, like us they rely on their elders to teach them what they need to know. Not only do they have the largest brain of any land animal (5 kg or 11 lb), but the structure and complexity of their brains is similar to that of a human. The first functional M.R.I. scan of an elephant brain, taken in 2006, revealed a huge hippocampus, a seat of memory in the mammalian brain, which explains their extraordinary memory that far surpasses ours and spans a lifetime. Elephants are able to retain a mental map of their entire home range — an area the size of Rhode Island! 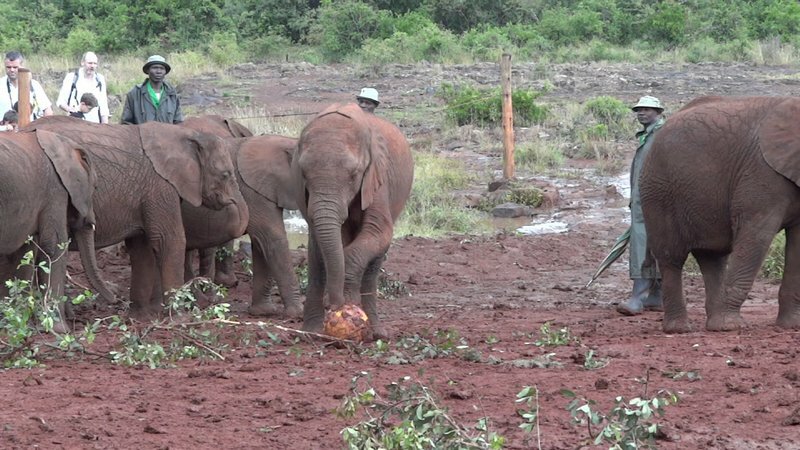 A number of elephants rehabilitated to wilderness by Sheldrick Trust have periodically returned to their sanctuary in Tsavo National Park with their own wild-born calves in order to reunite with their human “allomothers” and to introduce their offspring to the human “allograndmothers”! The M.R.I. scan also showed a prominent structure in the limbic system, which processes emotions – again no wonder that they feel many of the same emotions as us - happiness, blues, envy, jealousy, sense of fierce competition and above all, a strong sense of family. It was obvious, as we watched in Amboseli, that babies were the centre of attention of the herd. A baby was never left unattended; it was always protected on both sides by mother and aunties, getting assured with trunk pats from time to time. We also witnessed the values of compassion and standing by others in times of adversity when, one young bull could not keep up with the pace of the herd due to an injured leg, and another family member, probably his sister, ensured that she walked just behind him as he limped slowly after the herd. Probably the most unique thing that binds us together is the sense of death. The elephants grieve deeply for lost loved ones, shedding tears, suffering depression and even engaging in intense mourning, burial rituals and week long vigils over the body. 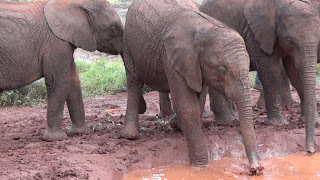 In Sheldrick orphanage, the human ‘‘allomothers’’ sleep with young orphans at night in stables, but they always rotate from one elephant to the next so that the orphans grow fond of all the keepers. Otherwise an elephant would form such a strong bond with one keeper that whenever he or she was absent, that elephant would grieve as if over the loss of a family member, often becoming physically ill or may even die – which did happen during the early years of the set up. Not all elephants can be called friendly though - distance is best maintained from bachelor herds and especially lone bachelor elephants. We saw a bull approaching us in Amboseli from the mist of heat and dust, bringing back memories of a bull charge from the past. An aggressive bachelor elephant in musth (Persian for intoxicated, a periodic condition in bull elephants), with thick tar-like discharge trickling down the sides of its head, had headed straight at us in Corbett National Park. After all these years, I can still recollect the relief on our driver’s face after he had got out of the rogue’s way to safety by swiftly reversing the car. Thankfully the lone bull at Amboseli had no interest whatsoever in us and soon disappeared out of our vision. At a macro level for Amboseli elephants, the atmosphere may not be too friendly, as there may not be enough land and water for everybody, including humans, and elephants do need massive tracts of land. We watched the animals as they trekked peacefully as families in twilight, different groups keeping a respectful distance between each other, "to go to sleep" accordingly to Andrew. The daily treks are not likely to be for pleasure, they are usually for survival - water, food and rest - and elephants need the first two in plenty. In times of drought, not all old, ill and young survive the treks. And humans and elephants are not on friendliest of terms everywhere, to say the least. Poaching and habitat destruction mean that there are significantly fewer older matriarchs, female caregivers and elder bulls to guide and keep others in check. Calves are now being born to and raised by young inexperienced mothers with very little traditional support system. The elephants of decimated herds often exhibit post-trauma behaviour like humans: abnormal startle response, unpredictable asocial behaviour, inattentive mothering and hyper aggression, sometimes leading to unwarranted attacks on humans and other animals. It is not too difficult to kill an elephant; it could even be done with poisoned watermelons. Larger and unable to hide, long-lived, slow-breeding animals, as they are (22-23 months in gestation); they are more susceptible to over hunting than other animals. States have responded to the problem of poaching in varied ways: - from “elephants take up a lot of space and drink a lot of water (they do consume about 100 to 200 kgs or 220 to 440 lb food and 113.5 litres or 30 gallons of water each day indeed), they would have to pay for their room and board with their ivory” to burning of 10 plus tons of ivory stocks to set an example; but to this day thousands of elephants die each year so that their tusks can be carved into, among other things, religious objects all over the world. The maddening violence revolves around the heavy upper incisors (the heaviest tusks recorded were 117kg) - white ivory of the savannah elephants and even more precious yellow ivory of the smaller, forest elephant of central and western Africa. The targeted poaching of tusked animals has given a much larger chance of mating to elephants with small tusks or no tusks at all, resulting in the birth of large numbers of tusk less elephants, approaching 30% in some populations. Elephants use their tusks to dig in the ground for necessary minerals, roots and water; to spar with one another for mating rights; to debark trees to eat the bark; to dig into baobab trees to get at the pulp inside; to move trees and branches when clearing a path; and for marking trees to establish territory. Without tusks, elephant behaviour could change dramatically - is this how evolution works? There is also a rather unique view of elephant decline. In sub-Saharan Africa, the relationship between nomadic pastoralists and elephants was mutually facilitative - elephants converted bush country to grassland, while the nomads’ cattle in turn stimulated the regrowth of bush preferred by elephants. That changed with the advent of agriculture as farmers came in direct competition with elephants with similar habitat preference - medium to high rainfall regimes, soils capable of producing edible vegetation, and access to drinking water. Thus every hectare cultivated was a hectare lost to elephants. Only in 1950s, with the sheer force of human numbers, some what aided by firearms, did the balance tip in favour of people over elephants. Thus according to this view, ivory is not the cause, but a by-product of the farmer elephant tussle on-going for more than 2000 years. Daylight had faded by the time we went back to the lodge. Aamir was able to enjoy the appetising dinner spread and the subsequent New Year eve celebrations, only after all concerned parties had resigned to the fate, albeit with reluctance, that 2011 sales targets simply could not be pursued any further. Now that he finally had the audience of both parents, Adi danced merrily to the background music; constantly vying to be in the thick of activities with other children around; and sometimes troubled by the fact that the older kids were choosing to ignore him for most part of the time. Soon it was time to usher in 2012 and yes, to set new targets for the New Year - but that would come later, for now it meant no more conference calls for at least the next two days! Celebrations over and in the quietude of our room, the day’s experiences played back in my mind. How grossly mistaken is the language to associate thick skin with insensitivity! Lines written by Henry Beston (an American writer and naturalist) in "The Outmost House" in 1928 say it all about the perceptive pachyderms and their life and death interlock with us. "In a world older and more complete than ours, they (animals) move finished and complete, gifted with extensions of the senses we have lost or never attained, living by voices we shall never hear. They are not brethren, they are not underlings, they are other Nations, caught with ourselves in the net of life and time, fellow prisoners of the splendour and travail of the earth".